Winter hardy to USDA Zones 7-9 where this evergreen shrub is typically grown in organically rich, acidic, well-drained soils with consistent moisture in part shade locations. Established plants do well with moderate but even moisture. Plants appreciate protection from early morning sun and from direct hot afternoon sun. They often thrive in sun-dappled part shade conditions under the protection of tree canopies. Protection from strong winds is also important. Apply a root mulch (leaves or shredded bark). Prune after flowering to thin branching and to control size and shape. Most camellias are purchased in pots. When transplanting them into the garden, it is important to not plant them too deep (soil level in the ground should be the same as the soil level in the pot). This plant is not reliably winter hardy to the St. Louis area (USDA Zone 6a). However, with protection and mild winter weather (temperatures that do not dip below zero degrees F), this camellia may survive winters outdoors in St. Louis. If attempted in St. Louis, this shrub should be grown in a sheltered and protected microclimate such as shaded areas near the south side of a home or building. Plants may be effectively grown in tubs or other large containers. Where not winter hardy, containers may be overwintered in a cool greenhouse where necessary growing conditions (including bright light and cool winter temperatures of 45-60 degrees F) can be met. 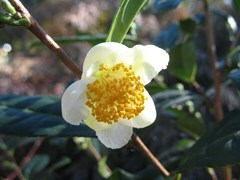 Processed leaves from Camellia sinensis and its many cultivars yield the tea leaves of commerce. Most commercial cultivation occurs in Asia (China to Burma and Sri Lanka). This camellia is also grown ornamentally for its excellent foliage and small but attractive fall flowers. It is probably native to China. It typically grows to 10-15' tall, but can easily be trimmed shorter (e.g., to 4-6' tall) or shaped as a hedge. Leathery, serrate, elliptic, glossy dark green leaves (to 5" long) are evergreen. Fragrant white flowers (to 1 1/2" across) with yellow stamens bloom in fall to early winter. Flowers are sometimes partially hidden by plant foliage. Fruit is a smooth and shiny capsule (to 3/4" long). Camellias are susceptible to a number of fungal diseases including leaf spots, anthracnose, viruses, black mold, petal blight, canker and root rot. If petal blight occurs (browning that runs from edges to the center), all infected plant parts should be promptly removed. Yellow leaves with green veins may indicate chlorosis which can be treated by adding iron/iron chelates to the soil. Scale can be a troublesome insect pest. Watch for aphids, planthoppers and spider mites. Where winter hardy, this flowering evergreen camellia makes an excellent addition to shady areas of the landscape such as woodland gardens, shrub borders, backgrounds, lawns and around homes. It may be grown as a specimen or in small groups, or it may be trimmed as a hedge. In St. Louis, experimental plantings must be sited in well-protected locations around houses, foundations and patios or in containers that can be overwintered in greenhouses. Excellent foliage and flowers can be fully appreciated without regard to the potential use of the leaves for tea.